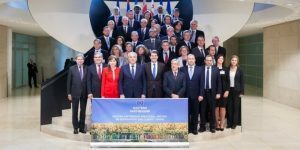 On 18 October 2016 Luxembourg hosted the first formal ministerial meeting dedicated to environment and climate change between the Ministers of Environment from the EU and the six EaP countries. European Commissioners Karmenu Vella (Environment, Fisheries and Maritime Affairs) and Johannes Hahn (European Neighbourhood Policy and Enlargement Negotiations) were also present at the event along with civil society organisations and experts from the EU member states and the six Eastern Partnership Countries. The discussions focused on environmental governance, green economy and the implementation of the Paris Agreement on Climate Change. At the end of the meeting, the ministers adopted a declaration on further cooperation on environment and climate change between the EU and EaP countries. The meeting was also an opportunity for experts and CSOs to discuss the progress on environment and climate change and shared best practices. The EaP CSF actively participated at the meeting and was represented by Plamena Borisova and Anna Golubovska-Onisimova. Speaking on behalf of the EaP CSF, Anna Golubovska-Onisimova stressed the need for the reinforcement of cooperation on environmental reform in EaP countries and called for clear time-framed targets for EaP countries regarding key achievements required for Good Environmental Governance.